Hackaday - Trendsideas.com - CalAsia Construction, Inc. | CalAsia Construction, Inc. Think of a Silicon Valley start-up in its early days, and you’ll probably imagine a couple of coffee-fuelled friends working passionately on their project late into the night, in a basement or garage. That’s at the opposite end of the spectrum to the cool sophistication you’d expect to find in a creative agency.So how would you bring those two extremes together in a single workplace environment? 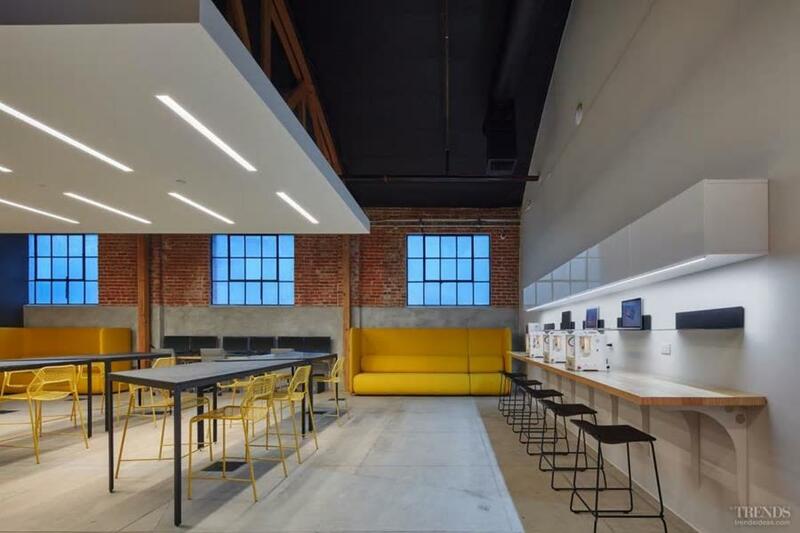 This was exactly the challenge facing California-based tech company Supplyframe when they brought architects Cory Grosser + Associates on board to create the DesignLab. Architect Cory Grosser says Supplyframe had recently acquired Hackaday, an online computer engineering community. “Hackaday was a strictly digital environment for people to share engineering ideas,” says Grosser. “DesignLab was to be a physical space where those ideas could be brought to life and tested in real life. It was an opportunity for Supplyframe to support Hackaday, while keeping a finger on the pulse of the latest tech innovations. 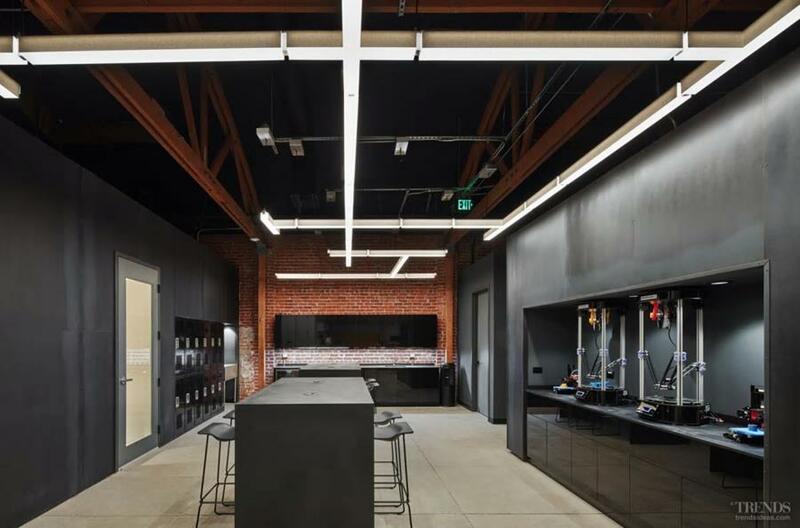 The building selected to house DesignLab was a 1910s building in Old Town Pasadena – just a few minutes walk from Supplyframe’s corporate head office, also designed by Cory Grosser + Associates. The historic brick building had had a diverse history, having once been home to an auto garage, Masarati dealership, Art Center College of Design annex, and even an Apple retailer. Like many old buildings in this earthquake-prone area, it had been structurally strengthened in an earlier retrofit. 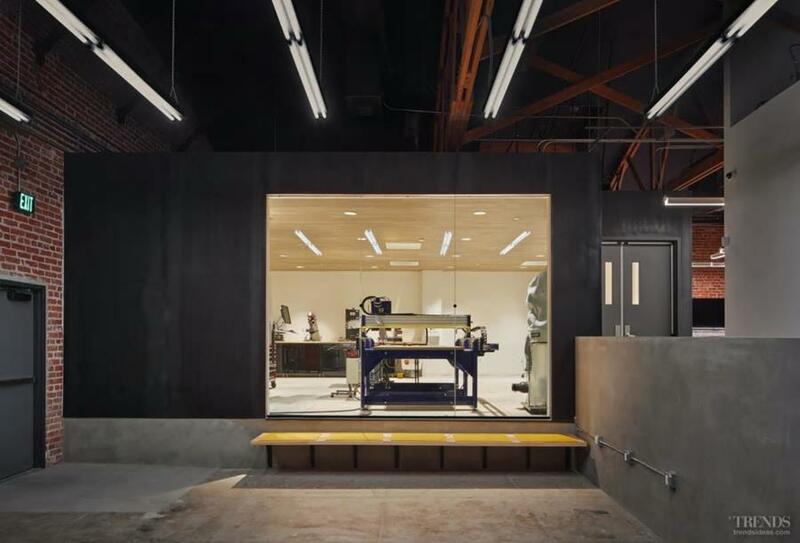 The interiors needed to accommodate flexible workspaces, 3D printing facilities, an engineering workshop and soldering stations, as well as community space for lectures and events. Front of house is a stark white, public-facing gallery space, creating the feeling of a crisply designed office reception area. 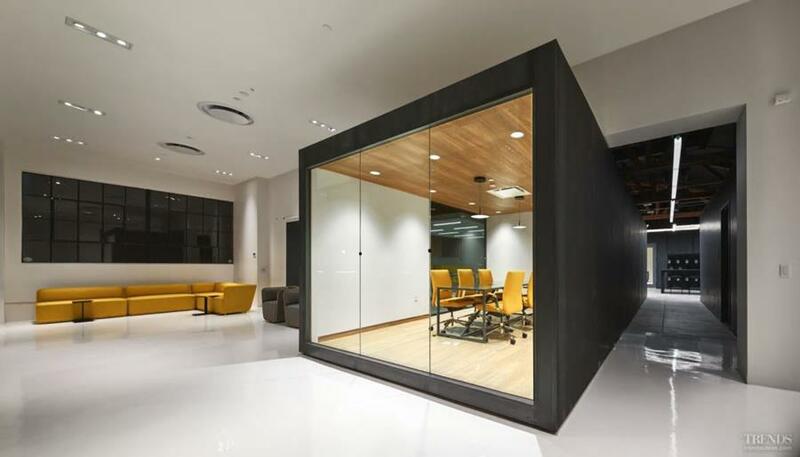 Adding to this look is the steel-clad conference room, which protrudes into the space from the work areas behind. The engineering workshop with its CNC machines was positioned at the opposite end of the 455m2 building, next to a large roller door and loading dock, giving easy access for production materials. 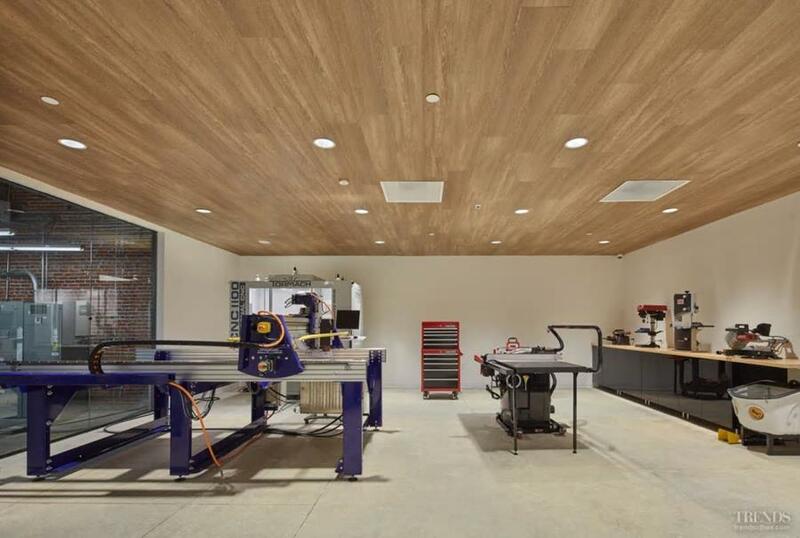 The main work area sits in between these two spaces and has been designed so that its work tables can be reconfigured for workshop events, or be totally cleared out for larger public gatherings. As a result, DesignLab isn’t the warm loft concept that the building might initially suggest, but rather is deliberately stark, industrial and elegant. 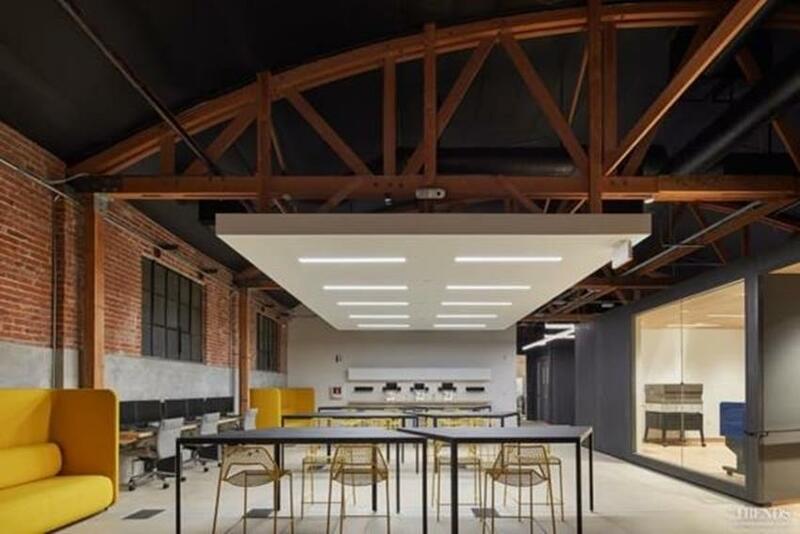 Referencing traditional factories and workshops, the design team employed a material palette of blackened cold rolled steel, raw concrete and rough-sawn timber, while the use of glass, glossy black and white surfaces, and premium furnishings reflect the elegance of workspaces in high-end creative agencies.